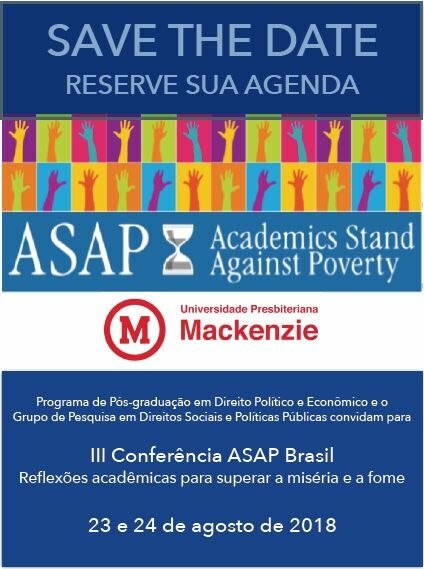 ASAP Brazil will host its 3rd international conference, “Academic Reflections to Overcome Misery and Hunger” on August 23rd – 24th at Mackenzie Presbyterian University in São Paulo. The members of ASAP seek to contribute to the improvement of public policies and debate on the subject, for the subsidy of legislative changes and for the adjustment of procedures. In view of the direct link with the research lines of the UPM’s Political and Economic Law Graduate Program (1. Citizenship modeling the State and 2. Economic Power and its legal limits), the Event will contribute significantly to the formation as well as in the practical thinking involved in the strategies to build public policies to fight poverty and hunger. For more information, visit the conference website or brazil.academicsstand.org.